Forum Index > Historical Arms Talk > Makers of Scottish Broadswords? Posted: Thu 09 Feb, 2017 10:11 am Post subject: Makers of Scottish Broadswords? I am interested in expanding my inventory of swords. Of late I have had a Scottish flavor. 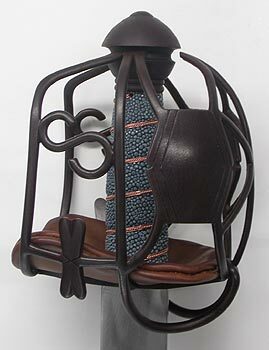 Currently that is being met by a rather nice Hanwei Basket Hilt, but that is not the best that could be had. So I have been poking about. I'm rather interested in having something besides the usual desultory reproductions of a regimental hilt-- something like a ribbon hilt, for example, or a 'S' hilt, or a diamond-paneled hilt... you get the idea. Obviously I'm familiar with the Hanwei offerings, which are nice in their own right but somewhat heavy and I understand the baskets are oversize (but then this is a common complaint with reproduction broadswords). Still, they do have a backsword, which stands out somewhat versus the almost uniform double-edged blade. Then Windlass has a couple, their brass-hilted broadsword (ugh) and their Eglington broadsword (better... but still not quite sure). Cold Steel's is probably (almost certainly?) made by Windlass. Let us not even think of Deepeeka. Universal Swords does have a broadsword, but it is yet another regimental style piece. Moving on up, the only retailers that I am personally familiar with are Armour Class in the UK and Southern Swords (also UK, retailing other manufacturers' pieces and wall-hangers). After this point I expect I am looking at custom for the most part. A&A has at least one example of an English basket hilt, so I expect they could make a Scottish hilt. Marco Danielli apparently has made some quite nice pieces. Having him make a basket on its own that I could hilt up with another blade appears to be an option. And of course there are Eljay Erickson and Vince Evans, but a.) $$$$$ and b.) long waits. Who else might you recommend? Bearing in mind that, regrettably, cost is a concern. I can't do $2000. Probably can't do $1000 either. My max might be $800. Making basket separately in order to have it fitted with a blade is definitely an option for me if it saves money. I've found the Armour Class basket-hilts to be okay but with reservations. I've seen several in person and they're all sort of rough in a strange way. They vary from example to example, but some seem quite unfinished in places. I'm not talking about perfection here, because a piece mimicking something from history should not be machine-perfect. I'm talking about sloppy execution. More distressing to me is that the baskets are somewhat oversized as far as I'm concerned. Darkwood Armoury is another supplier of semi-production pieces and they have some Scottish-English basket-hilts available. Their regular offerings are a bit rough but more can be paid to get them to a better, more period finish. My same comment about basket size applies here: of the four or five basket types I've handled, they are all oversized and some of the shaping in three-dimensions is a bit strange. Danelli Armouries might have a couple patterns already created for basket-hilts and could create a semi-production offering for you. Their wait time is pretty long at this point. I've got no hands-on experience with any of their pieces so cannot comment on finish or accuracy. This leaves you the custom route. The big makers here are Vince Evans and EB Erickson, but neither have an open queue right now so that is probably out. Rob Miller of Castle Keep might be another option. I've seen a couple of his offerings and liked them. They weren't as highly finished as Vince's or ElJay's examples and one had a tiny funkiness to its shaping, but they were both still quite good. I've got no idea what the price point of these are so I can't say much more. This all leaves one custom maker as far as I'm concerned: Arms & Armor of Minnesota. They have the ability to create an accurate version of pretty much any style of basket-hilt and will produce something that closely matches the antiques that inspire it. The downside is that the wait time would be long. Going custom takes a long time... and will blow your budget. The only thing here that really fits in your budget that is going to hit some of the marks is probably Armour Class or Darkwood. Sub-$1000 is going to have concessions baked in, particularly with basket size and proportions. All things considered, I'd suggest Armour Class. I think you'd be happy with it. I agree with Nathan: Armour Class is the best option right now, especially in the just under $1000 range (as long as the exchange rates hold). I would love to have A & A make a Scottish Basket Hilt, but the last time I inquired to them, I was told they have little interest in making one, due to the complexity and time required. Maybe things have changed - if you contact them, please let us know here if they are willing. I agree with Nathan and Chris on Armour Class, in every respect. I have one of their "S" hilts and it is certainly worth the money but, as Nathan says, there is an indefinable roughness to it. A custom maker is your best bet to get exactly what you want, but you are going to have to save a bit more money to get it. It is too bad that Donnie Shearer is out of the business because what he produced was reasonably priced and well-made. His work doesn't come up for sale very often but I actually bagged two of them in the Marketplace forum on this site and another one that never made it to the market from a fellow forumite. The reports are correct. I got one of the first ones they produced and the basket is huge, plus does not seem to be very sturdy. The originals had rather thin bars too, which seems to be common among post-Culloden basket hilts. Wow, Lin, that thing is huge! Those basket types were a bit on the larger side, but that one looks massive. The shaping also looks strange, though my caveat is that I can only see it in the single photo of course. The shape is strange, in fact it looks rather irregular in person. The best way to view it, i.e. the view that looks a little bit like an original is the side of the basket. 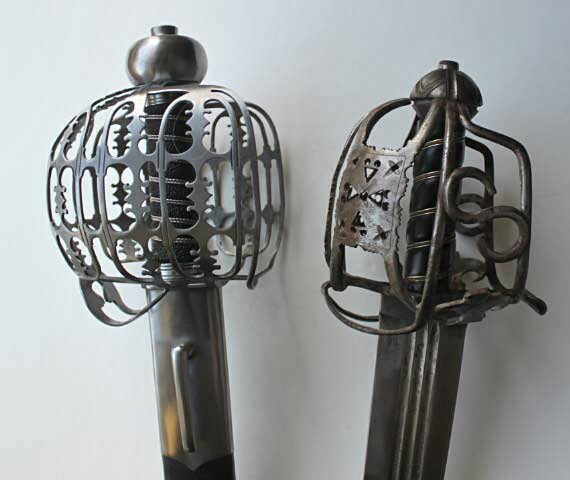 Withers' book, on page 125, pictures a pinch of snuff hilt which this one seems to attempt to duplicate and which has a very large basket, front to back. I wish Mr. Withers had seen fit to give some dimensions of these swords in the text! Funny you should mention this because I think it nails the biggest problem with lower-end production offerings on many swords, but especially on complex hilts like basket-hilts. Many of these makers get it right or get it close when looking at the hilt straight-on but fail miserably when comparing the objects' volumes and shapes in three dimensions. Why is this? Because these makers have almost no hands-on experience with originals let alone experience with viewing them in museums. They design and make these items based on photos in books... and what is published in books? The straight-on photograph of the one side of the hilt. The other problem with this is that they really have no idea of how big these hilts are supposed to be because the hilts are generally photographed all alone and not next to anything else for comparison. Interesting stuff! I also have been a bit interested in basket-hilts lately, so it's good to read all the opinions here, great info for novices. Just a head's up for everyone: my work queue is almost caught up, and sometime late this year or early next year I will be accepting commissions again. However, I do not want to have a jammed up queue ever again. So what I will be doing is accepting between 2-4 projects per workyear. This should enable me to complete all new projects within a calendar year, thus cutting down on wait times for the customers. Lin, is the sword next to the Eglington your AC? The blade looks wider than others I've seen. The sword on the right is a custom made sword by Donnie Shearer. I have attached a photo of the Armour Class hilt. It is from their site and not the one I own but there is no difference, except that the "dog bone" guard has been bent down to come closer to the original in shape on mine. I have been told that Donnie had special blades made for him by Del Tin. He made the baskets, fittings and sheaths. The blade is quite wide - 2 1/8 inches at the hilt - and is marked with Andrea Ferara and a quote from The Aeneid. It is a large sword but surprisingly well-balanced and feels good in the hand. Ditto...very good analysis of the problem. Thanks, it looks great by the way. I suppose that also brings another alternative to the table; make one yourself. Some of the hanwei blades look okay, there was also a Windlass medieval sword that had potential as a donor. Then have the basket custom made, and assemble everything yourself. You should be able to do that for $800 or maybe even a little less if you shop around.